There are spoilers in this review. A consistent reminder that there is a heavy Self Harm Trigger in this show in general. So this show remains really difficult to write about when you know the end result and don’t want to spoil anyone. Yiiiiikes. Anyway, I’m going to keep trying, because why not. I am curious who people think is the culprit if they don’t know the ending. Or is it obvious? I guess we’ll see. Previously on Sharp Objects, we were introduced to Camille, played by Amy Adams, a troubled journalist with an alcohol problem who self-harms and has cut words on her body. She was sent back to her old town where two girls have been murdered to see if it is a story worth breaking her career on. She’s forced to relive the death of her sister when she was young, and her very difficult relationship with her mother Adora, the richest woman in town. She’s met her sister Amma, who lets her mom dress her up like a doll but rebels when she’s not being watched. Camille found the body of the second victim, and she met detective Richard Willis who is trying to figure out if this is the start of a serial killer. So Natalie has been found dead now, and it’s time for her funeral. Her body is not in the casket since it’s still in evidence, but the family has to go through the motions. Her mother talks about Natalie and says she wants revenge, and I’m like I feel you lady, that’s more honest than pretending forgiving and forgetting is a possible thing. Adora insists they all go because of appearances, but also because she was a mentor of sorts to Natalie. Richard’s curious about why the first girl Ann was killed in the woods but Natalie was planted brashly out in the open. That was a big risk to take with people around. The teeth were pulled out too (yuck) so yeah, this seems ritualistic aka serial-ish. They are assuming the killer is a man, but Camille seems to have some doubts about that. She speaks to a kid who says he saw Natalie go into the woods with a “woman in white.” It’s an old town tale about a woman who kills children, but she’s suspicious. The police disagree with her because the kid is known to lie, and his mother’s a methhead with cancer. Camille doesn’t think that should mean no one listens to them. Everyone’s pretty judgmental in this town, aren’t they? What a surprise. This is a slow story in the sense that everything is very atmospheric. It’s slow and pensive. Very visually pleasing to watch. 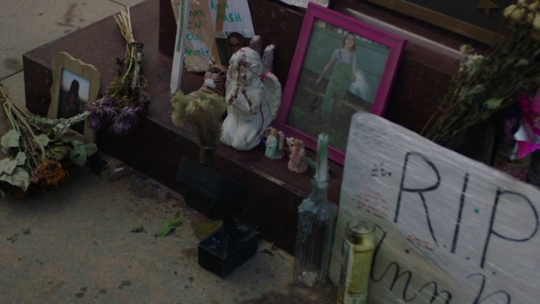 We see glimpses of the death of Camille’s sister, after Camille left the funeral she tried to find comfort in her mother who wasn’t having it. Her mother has clearly always disliked her, since we see that even when she’s a kid, and certainly now. She’s embarrassed by Camille’s behavior. Camille has to deal with catty high school people talking about how they’re suspicious of Natalie’s brother for caring too much. This town is full of jerks, basically, no one is relatable but it’s only 8 hours so it’s not like I have to care about them. Amma runs into Camille earlier, and Camille lets her get away with sneaking vodka into soda and basically being a rowdy teenager. Later on Amma breaks down crying with her parents and Camille is startled, but her mother takes it out on her and says that she wanted to help Natalie because she clearly couldn’t help Camille. Kudos to Patricia Clarkson because she’s loathsome but you can see why she believes every word out of her own mouth. And she’s not SO loathsome that you believe she’s a monster, just clearly not a very good mother. Putting it mildly. Also those mean girls at the funeral mentioned they didn’t think Natalie was who her mother was saying at the eulogy. Maybe she had some skeletons of her own too? And nothing in this town is what it seems. So yes this show is slow but I don’t find it boring. It’s all well acted and shot and it slowly unfurls and keeps you engaged. If someone is looking for action and chasing bad guys though, you’re going to be disappointed. Gone Girl didn’t have action that way either, she finds drama in damaged people being damaged. I know the end result of the book but I’ll admit I don’t remember everything in between, so the next few episodes could still be a surprise on the way to the end. Seriously though it is hard to talk about this show so carefully! Posted in Sharp Objects, TV Show, TVReview and tagged with amy adams, chris messina, Eliza Scanlen, Gillian Flynn, hbo, Henry Czerny, patricia clarkson, Sharp Objects.